So you've discovered the fun of pinning your favorite ideas, inspirations, and future plans to your Pinterest page. And you've learned how to follow other pinners you like and repin the best of their ideas to your boards. But now that you understand the basics of Pinterest, what's next? Here are three handy ways to get even more out of the social network service that is inspiring millions. When you find a great idea on the Internet that you want to pin to your board, you usually have to copy the Web address into Pinterest or find the Pin It button embedded on the site where you found the image. A quicker way is to add the "Pin It" button to your browser's bookmarks bar. Go to the Pinterest goodies page, and either drag the "Pin It" button to your shortcuts bar or add it manually. Pinterest will automatically detect what browser you're using and display directions on exactly how to install the button. Now when you see something that inspires you on the web, you just click the "Pin It" button. A browser window will open with a list of the images and video it detects on the page. You click on the one you you want and then you are given the option to add a caption and assign the board you want it pinned to. Viola! You just pinned a great idea to your Pinterest page. Pinterest provides a great way to see the ideas and inspirations of others and with PinPointing, you can turn those dreams into actual gifts. The PinPointing page lets you type in the Pinterest name of a friend. Then, using the catalog of online retailer Zappos, it matches pinned products on your friend's board with actual items you can buy for them. 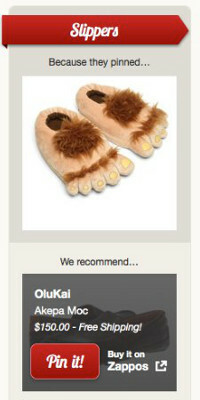 Say your friend pinned a picture of warm, fuzzy slippers. Zappos will show you a line of comfortable footwear you could purchase for them. What better way to pick the perfect gift than one based on items they are passionate enough about to pin to their boards? The only caveat we have here is to check why PinPointing is recommending the products that it does. If you hold your mouse over the "Because they pinned..." image, it will bring up the caption for the image that prompted the recommendation. So if your friend captioned "These slippers are atrocious!" she may not exactly be proclaiming her long held desire for a new pair of foot warmers. 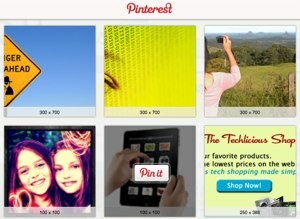 Pinterest has apps for both iPhone and Android devices. You can now pin things you see on your mobile web browser, repin from your friends' boards and browse for inspiration while you're out and about. And here's something you can't do so easily without the app: you can take a picture with your phone of something cool and pin it immediately. The Pinterest app is available for free on iTunes and Google Play. We hope these tips help you get the most out of the booming social network. If you have any tips of your own, share them below in the comments. Those slippers are so funny! I tried to avoid it for as long as I could, only because I knew I would spend way too much time there! Thanks for the extra tips!